She was a writer of lives. Penelope Niven (1939-2014) was born in Waxhaw, North Carolina, to Olin Niven, a postal inspector, and Eleanor Niven, a teacher. When she was five years old, she stood between her parents in the Methodist Church, holding her own hymnal, pretending she could read the words of a song she knew by heart. That little girl dreamed of writing poems and stories and plays. She never dreamed of writing biography. But the volume Niven produced fourteen years later, Carl Sandburg: A Biography (1991), was groundbreaking, and helped revive interest in a nearly forgotten poet, Lincoln biographer, and literary folk hero of his time. Niven came to the Sandburg project in the 1970s after volunteering to help reorganize an exhibition of his effects and papers at the National Park Service museum at his former home near Flat Rock, North Carolina. She had been volunteering at the Sandburg historic site for about three years when she decided that there was material for a book in the thousands of letters and manuscripts in the house where Sandburg had lived for twenty-two years before his death in 1967. She did not have herself in mind. “There were letters in the closets, manuscripts under the eaves, and under the beds,” she said to an interviewer in 1991, describing what she had told Sandburg’s former agent, Lucy Kroll, when she paid a visit to Connemara one day. Someone needed to write a book. But who? She followed the Sandburg book with biographies of two other fading luminaries of the Depression and World War II generation—Thornton Wilder, the novelist-playwright who created the perennial American stage favorites Our Town and The Skin of Our Teeth, and Edward Steichen, the photographer also known as curator of a traveling photo exhibition, “The Family of Man,” that drew millions to its message of universal human kinship during a postwar world tour. Her subjects shared certain qualities. Each had a fundamentally optimistic view of life; all had been embraced by the public and dismissed, to a greater or lesser extent, by critics for their supposed sentimentality and Reader’s Digest-accessibility. Niven’s Thornton Wilder: A Life (2012), the first major biography of that writer in thirty years, drew on previously undisclosed family papers and a vast correspondence between him and members of the literary pantheon of his time, including Gertrude Stein, Ernest Hemingway, and James Joyce. Charles Isherwood, writing in The New York Times, praised her sympathetic, “deeply researched and fluidly readable” account of Wilder’s complicated family life and deeply serious literary mind. Her Steichen biography helped clarify Steichen’s contributions to twentieth-century American art—and distinguish them from those of Alfred Stieglitz, his better-known fellow founder of photography as an art form, wrote The Washington Post. Niven revealed Steichen—the passionately artistic, relentlessly experimental, and more optimistic of the two photographers—as the more essentially American artist. She brought a spirited defense to the reputation of both Wilder and Steichen, and was praised for illuminating their stories with details from personal documents and unpublished works. Niven always believed that the book you are supposed to write finds you, not the other way around. In later years, she told friends that she had always considered herself a writer but had never found her subject or the time—as a teacher and a mother and wife who moved her household across the country several times in the course of her husband’s career—before she almost stumbled into her work as a late-blooming biographer of the nearly lost voices of an era. Her 2003 biography for children, Carl Sandburg: Adventures of a Poet, was awarded an International Reading Association Prize “for exceptionally distinguished literature for children,” one of six books honored among publications from ninety-nine countries. In addition, she penned a memoir, Swimming Lessons, published in 2004, and Voices and Silences, the 1993 autobiography of actor James Earl Jones, which they wrote together. It described how Mr. Jones, traumatized and virtually mute from the ages of six to fourteen because of a disabling stutter, became one of the stage’s most distinctive voices. 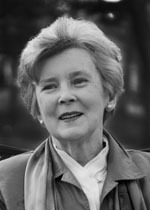 Niven received her bachelor’s degree from Greensboro College and a master’s degree in English from Wake Forest University. She taught high school English in Winston-Salem, suburban Maryland, and Richmond, Indiana. When you write biography, she discovered, you have to write with everything you are, everything you know, everything you yourself have lived. Writing biography demands that you employ everything you ever learned—and then learn even more in the daunting effort to do justice to another life. Niven was awarded two honorary doctorates—one from her alma mater Wake Forest University—three fellowships from the National Endowment for the Humanities, and the Thornton Wilder Visiting Fellowship at the Beinecke Rare Book and Manuscript Library at Yale University, among other honors. She also received the North Carolina Award in Literature, the highest honor the state bestows on an author. She lectured across the United States and in Switzerland, Canada, and Wales; served as an editor for various publications; and was a consultant for television films on Sandburg, Jones, and Steichen. Niven also spent twelve years as Writer-in-Residence at Salem College in Winston-Salem, where an international writing prize was named in her honor, along with the creative writing portfolio prize given each year to a Salem student. Her daughter, Jennifer Niven, is an award-winning author as well, and the two loved doing mother-daughter writing programs and workshops together, which they conducted throughout the U.S. and abroad. Penelope Niven died at seventy-five on August 28, 2014, in Winston-Salem. At the time of her death, she was working on several projects. She and Blanton Belk were completing his autobiography in celebration of the 50th anniversary of Up with People. Niven was also continuing her work on Thornton Wilder—preparing a book titled Wilder on Writing, and editing a Wilder Reader. In October of that year, she was to be the keynote speaker at the Burbank Public Library’s NEA-funded Big Read celebration of Our Town. In the summer of 2014, she returned from Barbados, where she was working on a project with world-renowned artist and friend Lonnie Eugene Stewart. As impressive as her career was, Penelope Niven’s legacy reaches far beyond her work. She always said her greatest work of art was her daughter, and their profoundly close mother-daughter relationship was inspiring. Niven was loved by all who knew her—and she made a lasting impact on the lives she touched. Her words and the joy with which she embraced each day fundamentally enriched lives around the world. Courtesy of the Carl Sandburg Festival.